The setting of Sitka, Alaska, in a tranquil bay on Baranof Island, is nothing short of spectacular. Tiny islands dense with evergreen trees dot the blue-green water, which is crisscrossed by dozens of fishing boats. Looming over the town and waterfront is Mount Edgecumbe, a Mount Fuji look-alike located on a nearby island. Sitka also has a rich legacy of artifacts and traditions from the Alaska Native, Russian and early-U.S. eras. It is the ancestral home of the Kiksadi Tlingit people. In the 1800s, before Alaska was sold to the U.S., the town was a major Russian port, headquarters of the Russian-American Company, established to promote the fur trade, and the capital of Russian North America. 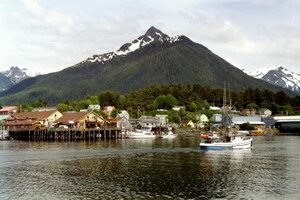 Sitka has 24 listings on the National Register of Historic Places, seven of which are National Historical Landmarks, and Sitka was named one of America's Dozen Distinctive Destinations by the National Trust for Historic Preservation. But don't spend all your time touring historic buildings—Sitka also has an abundance of wildlife. Humpback whales frolic in the bay; massive brown bears and Sitka black-tailed deer roam through nearby forests of Sitka spruce and hemlock; and thousands of seabirds, including the rare rhinoceros auklet and tufted puffin, flock to St. Lazaria National Wildlife Refuge at the mouth of Sitka Sound.